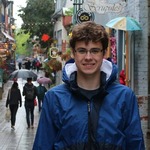 I am a rising sophomore at the College of William & Mary where I am studying physics and mathematics. This year I am on the iGEM team where I am doing mathematics modeling and simulations. I hope that my work in iGEM will provide me with experience in a variety of STEM disciplines. After William & Mary, I hope to pursue a doctorate in theoretical physics.